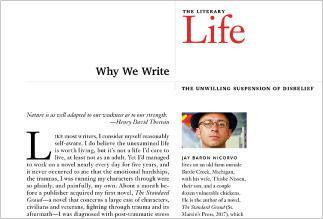 I just finished reading Jay Baron Nicorvo’s essay “Why We Write: The Unwilling Suspension of Disbelief” (January/February 2018), and I am so happy you chose to publish it. When I published my first book of poetry, , released by CavanKerry Press in 2006, which examines my experience as a survivor of childhood sexual violence, very few people were acknowledging that people like Nicorvo and has welcomed the voice of a male survivor of sexual violence into its pages, but especially now, in this moment of #MeToo and the awareness that movement has brought to the issue, it is both gratifying and affirming to hear from a fellow survivor who chooses to make his experience with post-traumatic stress disorder part of his creative work. Many thanks for publishing this essay.